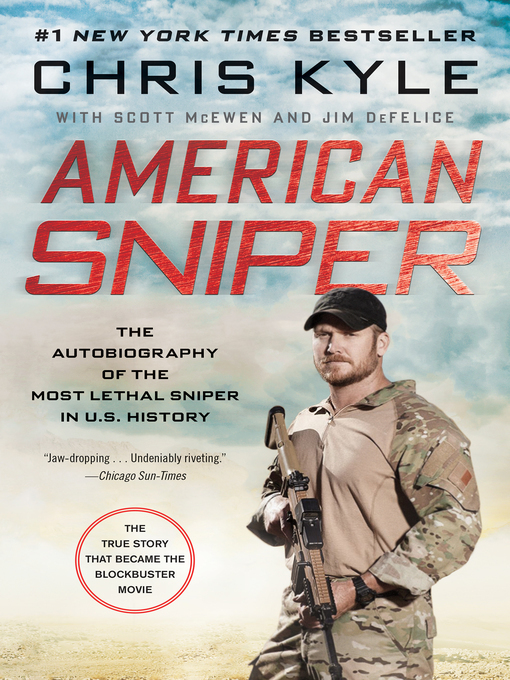 The item American sniper : The Autobiography of the Most Lethal Sniper in U.S. Military History., Chris Kyle, (electronic resource) represents a specific, individual, material embodiment of a distinct intellectual or artistic creation found in Lawrence Public Library. NOW A BLOCKBUSTER MOTION PICTURE DIRECTED BY CLINT EASTWOOD&#8212; NOMINATED FOR SIX ACADEMY AWARDS, INCLUDING BEST PICTUREHe is the deadliest American sniper ever, called "the devil" by the enemies he hunted and "the legend" by his Navy SEAL brothers . . .From 1999 to 2009, U.S. Navy SEAL Chris Kyle recorded the most career sniper kills in United States military history. The Pentagon has officially confirmed more than 150 of Kyles kills (the previous American record was 109), but it has declined to verify the astonishing total number for this book. Iraqi insurgents feared Kyle so much they named him al-Shaitan ("the devil") and placed a bounty on his head. Kyle earned legendary status among his fellow SEALs, Marines, and U.S. Army soldiers, whom he protected with deadly accuracy from rooftops and stealth positions. Gripping and unforgettable, Kyle's masterful account of his extraordinary battlefield experiences ranks as one of the great war memoirs of all..
American sniper : The Autobiography of the Most Lethal Sniper in U.S. Military History. The Autobiography of the Most Lethal Sniper in U.S. Military History.